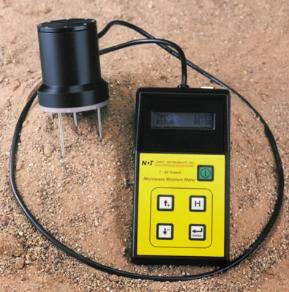 A microwave meter for rapid determination of moisture content in sand and other fine and coarse aggregrates. 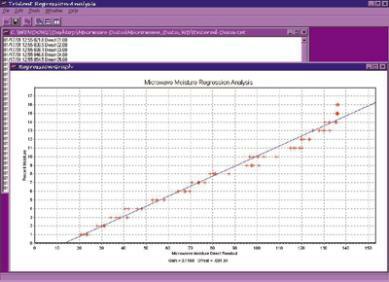 A Microwave meter for rapid determination of moisture content in sand and other fine and coarse aggregates. The Trident™ T-T-90 utilizes the latest microwave and microprocessor technology to measure moisture content in various fine and coarse-grained materials. The prongs of the probe are inserted into the material to be tested and the percentage of moisture content is instantaneously shown on the easy to read display. An average of five to ten readings is normally taken in order to ensure a valid result. This output is converted by the integrated microprocessor and the moisture content is displayed directly as a percentage of dry weight. The Trident™ comes calibrated for both sand and aggregate, and can be programmed by the user with up to ten different materials. The Trident™ can store more than 150 readings - complete with time and date for future reference. Data can be recalled via USB interface to a personal computer.